In a highly competitive marketplace, most of the companies are facing decreased revenue and customer attrition. As the world is shifting to artificial intelligence, companies are also looking forward to how they can use AI to the fullest. More than 30 percent of companies are expected to pursue advanced analytics and cognitive computing to stay competitive and drive revenue. Companies that are attempting to optimize their sales efforts need capabilities to analyze historical data, forecast what might happen in the future. The promise of doing it right and becoming a data-driven organization is great. Huge ROI’s can be enjoyed as evidenced by companies that have optimized their sales & marketing, lowered operating costs, increased revenues, or improved their customer service and product mix. Why is predictive analytics important for sales forecasting? Predictive Analytics, which use statistical models and forecasts techniques to understand the future and answer: “What could happen?”. Predictive analytics provides companies with actionable insights based on data. Predictive analytics provide estimates about the likelihood of a future outcome. It is important to remember that no statistical algorithm can “predict” the future with 100% certainty. Companies use these statistics to forecast what might happen in the future. Sales are one of the most important parts of the organization, without it, business becomes a hobby or a charitable organization. According to CSO Insights, approximately 54% of all forecasted deals by sellers never make it to the finish line. As the world is changing at a very fast pace so does the sales methods of organizations. It’s been estimated that by 2020, predictive and prescriptive analytics will attract 40 percent of enterprises with the new investments in business intelligence and analytics. There are many approaches to sales forecasting, but not all approaches will result in an accurate forecast. When searching for a sales forecasting solution that will improve forecast accuracy, a solution that uses historical analysis and predictive analytic techniques is generally superior to one that doesn’t. Helping your sellers and sales managers make data-driven decisions that enable the larger sales teams to be more efficient and effective. Enabling sellers, sales managers, and executives to spend more time on customer-facing activities, instead of on manual, tool-related activities. Giving an end-to-end view of the sales processes and desired outcomes. Facebook uses Predictive analytics which offers friend and page recommendations based on your current social circle and interests. Facebook’s algorithm examines the data, identifies trends and pattern and then makes the recommendation. Amazon predicts and prescribes to their customer what they want before they ask for it. Amazon does this by using data from your prior Amazon activity, including time on site, duration of views, links clicked and hovered over, shopping cart activity and wish lists. Google uses predictive analytics by providing the options while you are searching for anything on google. It basically extracts and processes data that is searched by most of the people or which is trending. Netflix utilizes the millions of bits of data they have to predict the shows which viewers most likely to watch. They have tons of data on their viewers – including the content, watch time as well as the conventional demographic & psychographic data. The company then uses this information to predict the content which will most likely be successful if streamed through the service. Netflix also utilizes a well-refined recommendation algorithm to predict what users will likely want to watch. Predictive analytics combined with geo-targeting can produce remarkable sales results, as the experience of sportswear-maker Helly Hansen shows. Helly Hansen achieved 170% conversion rate by predicting what its visitors were likely to buy based on weather forecasts in the visitor’s location. So, how to excel in providing the best customer experience(CX)? well, the answer is “Cognitive computing”, which involves self-learning systems that use data mining, pattern recognition, and natural language processing to work the same way as the human brain works. The main purpose of using cognitive computing is to create automated IT systems that are capable of solving problems without requiring human assistance. Its goal is not to build machines that can think for themselves and replace people, but to build machines that help an organization to look at vast amounts of data in whole new ways. By using cognitive computing an organization can achieve next level sales. IBM Watson is one of the examples of cognitive analytics tools. IBM supercomputer combines artificial intelligence (AI) and sophisticated analytical software for optimal performance as a “question answering” machine. Even Fortune 50 companies like Walmart, Amazon, and Google are using Predictive Analysis to enhance their customer experience (CX). There are more than 20 dozen mail conversations happening in sales teams with the customers, as a sales manager are you aware of each and every conversation? For the sales manager, it will be tough to go through each and every email, and there are high chances that you are missing one or two important emails as well, AI can help you in this. It will provide you those emails which need your attention the most. CRMIT has adopted predictive and cognitive analysis. It is applied to any type of text data that is coming through any channel (emails/social/meetings notes). Through sentiment analysis, you will be aware of your customer’s pain points and what they are expecting from you before they express it so that you can provide them the exceptional customer experience(CX). The idea is to aggregate all of this text data from all channels, in a specific context e.g. an opportunity or an account or a product and sieve through it to extract insights and then stitch the pieces to provide recommendations or feed it into a predictive intelligence layer a company already have. Big data and traditional methods don’t have the same potential as predictive analytics to drive actions. 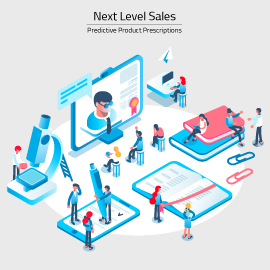 Predictive analytics can be used throughout the organization, from forecasting customer behavior and purchasing patterns to identifying trends in sales activities. An organization can prepare for this by going one step beyond prediction and actually prescribe the recommended course of action for the customers. Data is an invaluable asset that companies can leverage to a great effect through modern predictive technology. AI is already being used to automate certain processes and drive efficiencies, help employees are more productive and devote more time to more strategic business needs, and create new work and services that were not possible in the past. It’s all about Artificial Intelligence in every field of business by 2020, Are you ready for it? If not this is the right time to plan your activities for the same as the world is advancing at a place where an organization cannot afford to stay in their comfort zone for long. This entry was posted in Artificial Intelligence, cognitive sales, predictive sales. Bookmark the permalink. I am actually happy to glance at this blog posts. which includes tons of useful facts, thanks for providing these kinds of statistics.